Every large nation in the world was directly or indirectly affected by the impact of war during the course of the twentieth century, and while the historical narratives of war of these nations are well known, far less is understood about how small islands coped. These islands – often not nations in their own right but small outposts of other kingdoms, countries, and nations – have been relegated to mere footnotes in history and heritage studies as interesting case studies or unimportant curiosities. Yet for many of these small islands, war had an enduring impact on their history, memory, intangible heritage and future cultural practices, leaving a legacy that demanded some form of local response. 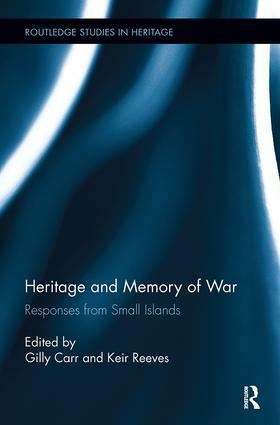 This is the first comprehensive volume dedicated to what the memories, legacies and heritage of war in small islands can teach those who live outside them, through closely related historical and contemporary case studies covering 20th and 21st century conflict across the globe. The volume investigates a number of important questions: Why and how is war memory so enduring in small islands? Do factors such as population size, island size, isolation or geography have any impact? Do close ties of kinship and group identity enable collective memories to shape identity and its resulting war-related heritage? This book contributes to heritage and memory studies and to conflict and historical archaeology by providing a globally wide-ranging comparative assessment of small islands and their experiences of war. Heritage of War in Small Island Territories is of relevance to students, researchers, heritage and tourism professionals, local governments, and NGOs. Chapter 13: War remnants of the Greek archipelago: persistent memories or fragile heritage? Gilly Carr is a Senior Lecturer and Academic Director in Archaeology at the University of Cambridge’s Institute of Continuing Education, UK. She is also a Fellow and Director of Studies in Archaeology and Anthropology at St. Catharine’s College, UK. She is author of Legacies of Occupation: Archaeology, Heritage and Memory in the Channel Islands (2014) and co-editor (with Harold Mytum) of Cultural Heritage and Prisoners of War: Creativity Behind Barbed Wire (Routledge, 2012). Keir Reeves is Professor and Chair in Regional Engagement at Federation University, Australia. In 2013 he was a Visiting Fellow at Clare Hall, Cambridge, and a visiting researcher at the McDonald Institute for Archaeological Research at the University of Cambridge, UK where he worked with the Heritage Research Group in the Department of Archaeology and Anthropology. Keir is co-editor (with Bill Logan) of Places of Pain and Shame: Dealing with ‘Difficult Heritage’ (Routledge, 2009).